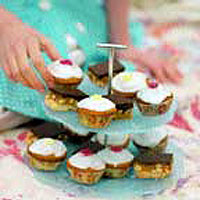 I cannot resist a cupcake, and this is the perfect sunshine version, to be taken on picnics or eaten at home. Preheat the oven to 200°C, gas mark 6 and line a couple of 12-bun cupcake or muffin tins with paper cases. Blitz all the cupcake ingredients, except the milk, in a food processor till fully combined. Process again, adding enough milk to make a batter with a smooth, flowing texture, then remove the blade and spoon the batter equally into the cases. Remember the cakes rise as they bake: there's enough mixture to fill each case adequately. Bake for around 20 minutes, by which time the sponge should be cooked through and springy to the touch. Remove from the oven, leave for 5 minutes or so, then arrange the cupcakes in their papers on a couple of wire racks to cool. Once they're cool, you can get on with the icing. Whisk the royal icing sugar with the lemon juice until thick and smooth: you want the icing to sit thickly on the cupcakes, not run off them. I like the icing coolly white, but if you want to go for full-on sun, then add a drop of yellow food colouring. No purist stance is intended here: after all, I now require you to top each cake with a sugar flower.